DIY Magnetic Fridge LEDs | OhGizmo! By Andrew Liszewski on 09/11/06 • Leave a comment! 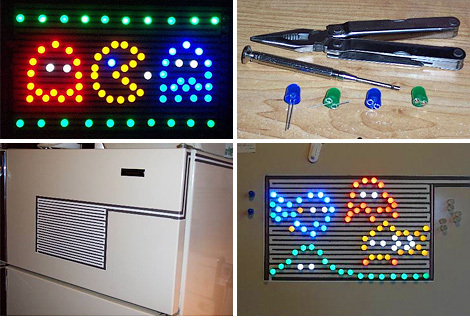 If you’ve got a lot of free time, some steady hands and a fridge you don’t mind painting then you’re going to want to check out these DIY LED fridge magnets on Instructables. The final product is kind of like a Lite-Brite but instead of plastic pegs poked through a hole you get magnetic LEDs that light up when stuck to the fridge. How does it work you ask? Well for starters very small magnets are glued to the trimmed wire leads on the underside of 3.6 volt LEDs (white, blue and green) while 2.6 volt LEDs (red and yellow) require an extra resistor to be added. The fridge itself is masked off and covered with a special conductive paint that runs around to the back of the fridge where power is supplied to the painted grid by a 4.5 Volt / 500 milliAmp AC adapter. The LED magnets will then light up when placed anywhere on the powered grid and look way cooler than magnetic poetry ever will.